The Palazzo Hotel, located at 3325 S. Las Vegas Boulevard, is a luxurious hotel and casino resort in Las Vegas. The hotel opened in 2007, just in time for New Year’s Eve! At 642 feet high, it is the tallest building in Vegas. The Palazzo is part of a large complex that includes The Venetian Resort and Casino and The Sands Convention Center. According to the US City Traveler, the Venetian/Palazzo complex is the largest hotel in the United States (53 floors and 8,107 rooms)! The Venetian Resort found ITSENCLOSURES by conducting an internet search for ‘outdoor monitor protection.’ Being established in this field of work, ITSENCLOSURES was a natural fit for the job. Overlooking the Vegas strip, this project made for a unique experience and challenging environment for electronics. The Palazzo Hotel desired to ‘make a splash’ with the construction of the state-of-the-art high roller suites. Each suite includes a private, relaxing pool for guests. Near the pool, The Palazzo wanted to install a TV for guests to watch sporting events or enjoy the latest reality show. Installing an LCD near water, in direct sunlight, and exposure to blistering desert heat is challenging without the right tools at your disposal. However, ITSENCLOSURES specializes in outdoor enclosure systems that are guaranteed to protect electronics from environmental concerns, including a pool with chlorine. 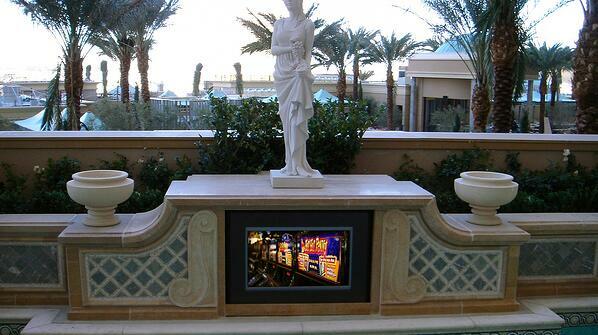 Multiple 32-inch ViewStation LCD enclosures were deployed in the guest suites at The Palazzo in Las Vegas. A small air conditioner is installed on the rear of the enclosure to keep the display and other electronics operating at an optimum temperature and regulated from the hot, dry desert air. The enclosure is recessed into a custom built, decorative wall, which includes a beautiful statue and large stone planters. When installing LCDs outdoors and near water, it must be protected by an enclosure. 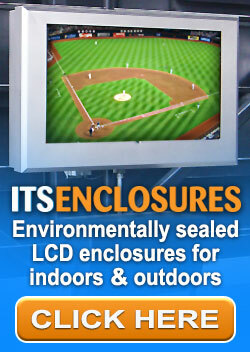 ITSENCLOSURES specializes in electronics’ protection with durable and heavy-duty LCD enclosures. The Palazzo Hotel wanted a ‘wow factor’ by the suite pools and ITSENCLOSURES was the perfect company to provide the necessary tools to complete the job. The elaborate stone wall and LCD enclosure makes for an eye-catching, exceptional structure. Carl Pastrone, Project Manager for the Venetian & Palazzo Hotels, was happy with the results, “ITSENCLOSURES provided an excellent solution for our display enclosure needs in the new Palazzo guest suites."